I balanced a plate brimming with potluck offerings on my knees and eavesdropped on a nearby conversation. It was sometime in1981, within the first year of our move from the Midwest to Seattle. I overheard two friends talking about their favorite radio show, All Things Considered on National Public Radio. I don’t remember their words, but I can still recall the excitement in their voices as they discussed the afternoon program’s mix of news, interviews, commentaries, reviews, and offbeat features. Until then, although I’d watched public television, I don’t think I even knew what public radio was. Soon, though, I was tuning in regularly to hear the day’s news from Susan Stamberg and later Noah Adams, Renée Montagne, and Robert Siegel (who still serves as co-host, now with Melissa Block). Before long I was listening in the morning, as well, to Morning Edition with Bob Edwards. It was his voice I heard on weekdays when my clock radio woke me in time for work. I especially looked forward to Edwards’s Friday morning calls to Tallahassee to talk with sportscasting legend Red Barber. It didn’t matter that I wasn’t much of a sports fan, because the conversations often digressed to the weather, Barber’s flower garden, history, and social issues. I was especially touched when “Colonel Bob” (as Barber referred to Edwards because of his “Kentucky Colonel” honor from his home state) inquired about Barber’s wife, Lylah. I know I cried when Edwards gave his final tribute to Barber when he died in 1992. So, during a recent visit with our son and his fiancée in Washington, DC, I was as excited to see the NPR logo when we drove by its headquarters as the cherry blossoms just starting to bud around the Capitol. After a little searching on the Internet, my husband discovered that NPR has a gift shop and offers public tours. A couple of days later, we stood in the lobby with a dozen other fans, sharing our names and our favorite NPR program. “Nice friend,” one woman replied. The guide steered us to a soundproof auditorium, sometimes used for live performances. That day, half a dozen people fiddled with a laptop and projector, preparing for a staff meeting. I thought back to a talk I’d attended at Earlham College (where my daughter was then a student) by Andrea Seabrook, who began reporting on the U.S. Congress for NPR in 2001. Herself an Earlham alum, Seabrook had spoken about the importance NPR placed on storytelling; I imagined that day’s staff meeting spending at least some time discussing storytelling craft. Because of NPR reporters’ skill with the narrative form, I’m among the thousands of listeners to experience a “driveway moment,” unable to get out of my car until I’ve heard their final words about an event and the people affected. I was just about to graduate from high school when NPR went on the air May 3, 1971; that was made possible by unanimous passage, in both houses of Congress, of the Public Broadcasting Act. It would be more than a decade before I started listening regularly and relying on the service as my primary news source. I felt like a star-struck teenager as we toured the new building that is home base for the staff I respect such as Lourdes Garcia-Navarro, Nina Totenberg, Steve Inskeep, Audie Cornish, and Richard Harris. That day, we took an elevator from the building’s main floor to the fourth floor to see an array of satellite dishes on the “green” rooftop, planted to provide cooling in the summer and to retain heat in the winter. The rooftop garden and many other features of the new building earned it a silver LEED rating by the U.S. Green Building Council. On the next two floors, the guide ushered us past cubicles for staff of Morning Edition and Weekend Edition; she pointed out Studio One and the cluster of workspaces for the researchers and librarians. Some people sat at desks in front of split-screen computers; others had raised their adjustable desktops so they could stand. The guide pointed out a round table in the center of the newsroom, crammed with computer screens and circled by chairs. She explained that when there’s “breaking news,” reporters cluster there to file stories. The desk was busy the very first time NPR broadcast from this building—the day of the bombing at last year’s Boston Marathon. The “breaking news” desk was quiet the day of our tour; instead, the most excitement was when we all streamed in to Studio 3. This fully-equipped back-up control room and broadcast studio is identical to Studios 1 and 2 that are in regular use. In the event of big news events or technical problems, reporters and technicians can step in to Studio 3 to keep the news flowing. As I sat at a microphone, I fantasized being interviewed by Alan Cheuse about my memoir. Not likely, but fun to imagine. 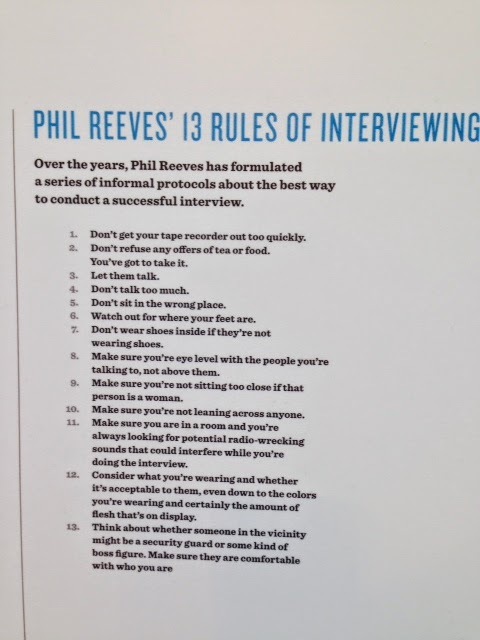 Back in the lobby after the tour, I took note of the display of NPR reporter Philip Reeves’ “13 Rules” – a mini-lesson in cross-cultural interviewing. SO glad you got to take that tour, Iris, and thank you for taking us with you, just in case I never get back to DC. Ah, a brush with fame – Melissa Block was your college classmate! Comments like yours and others I’ve received have convinced me I’m not the only start-struck, sentimental NPR fan. 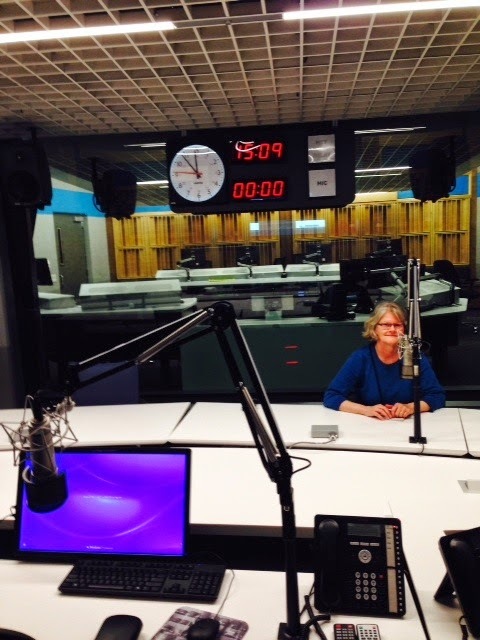 In fact, I learned on the tour that NPR is the largest radio organization in the U.S. with 975 stations and 27 million listeners! That’s a lot of people who love storytelling; lots of “driveway moments,” too. 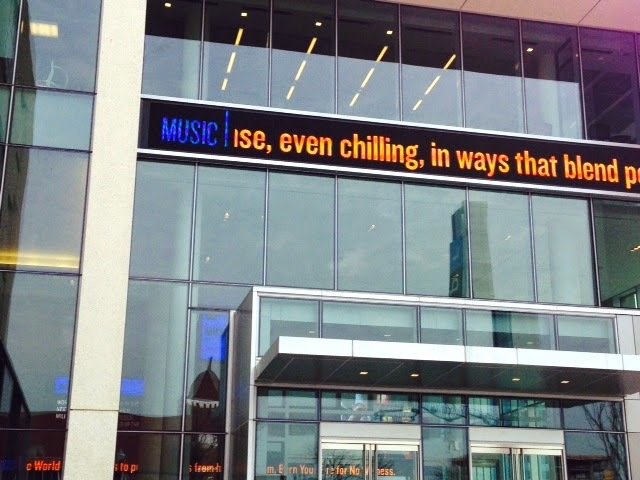 Thanks for sharing your appreciation for NPR.